Heritagem presents : A ravishing emerald and 2 diamonds ring. 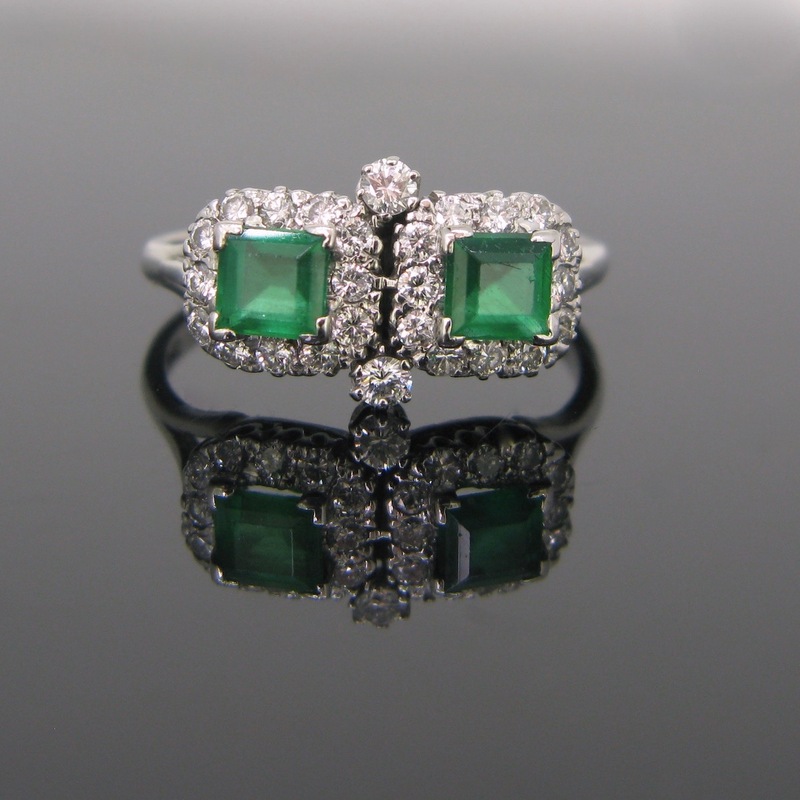 The center of this ring is set with a stunning emerald from Colombia. This beautiful gemstone weighs around 1,30ct and it is slightly included. It is framed on each side with an Asscher cut diamond, each weighing approximately 0,70ct with a white color H and and good clarity VS. The shouldfers of the ring was also set with 3 princess cut diamonds. This ring is the perfect wedding ring for those who love green. Emerald is linked with hope and harmony. It symbolizes the nature and the renascence of life. It celebrates 25 years of marriage :) The ring is completely made in platinum. It was engraved Pt3076 inside the ring band and it was controlled as platinum with the UK hallmark. It sizes 54 / 6,5 and it is in very good condition. Heritagem presents : This stunning ring features a lovely emerald cut aquamarine set on platinum and surrounded with rose cut diamond. The light blue gemstone weighs around 3.70ct and has very few inclusions. There is a total of 28 diamonds for a total weighing approximately 0,30ct. The ring is in good antique condition. . The diamonds are set into a millegrain setting and the back has a beautiful airy and flowery design. The ring weighs 5,2 gr and it sizes 55 / 7,25. It measures 25,12 x 19,9 x 18,31mm (0,98 x 0,78 x 0,72'). The ring was marked with the eagle and the dog' s head head, the French hallmark for 18kt gold and platinum. 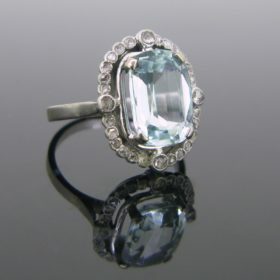 It was made in France at the very beginning of the 20th century.If you are a lover of antique jewellery and if aquamarine is your birthstone, this ring is made for you ;)Aquamarine symbolises purity, youth and hope. Due to its clarity and clearness, it helps to clarify your mind. All our items come with either a gemological report or a jewellery report with circa and all useful information. Heritagem presents : A lovely pair of earrings set with Tahitian pearls and diamonds. The center of each earrings is adorned with a greyish black Tahitian pearl which is 7,97 mm of diameter for one and 7.57 mm for the other one. They match perfectly together. They are both surrounded with a double crown of brilliant cut diamonds. There is a total carat weight of 0,80ct approximately (0,40ct per earrings). There is a double security for the clasp. The bar was controlled with the Uk hallmarks for 18kt gold. Pearl symbolises purity and innocence; they are usually wear by the bride for her wedding. The legend said that pearls are the tear-drops of the moon, fell in the sea. This is the only birthstone which have 5 months of the year : February, April, June (traditional) and November. Heritagem presents : A stunning Tanzanite and 2 diamonds ring. 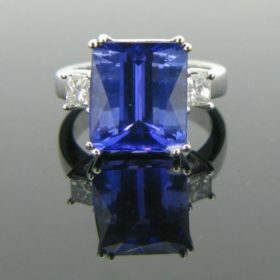 This ring is made in 18kt white gold and it is adorned with a beautiful indigo / blue tanzanite weighing 9,47ct. It measures12,32 x 10,93 x 7,82 mm. Its color is just captivating, it turns blue to indigo under a different source of light. The mount is quite airy, it let the light go through directly into the gemstone. The shoulders of the ring are set with 2 princess cut diamonds, each weighing approximately 0,30ct (H/VS). Inside the band ring we can see that it was engraved the weight of the tanzanite : T947, 18K for 18kt gold, Dyach, probably the maker's of the mount and the UK hallmarks. The ring is sized 56 / 7,5. The tanzanite is a rare gemstone which was discover during the Fifties in Tanzania, from which takes its name. You can only find this gem in Tanzania and it is very sought-after after the sapphire. Its color changes blue to indigo on a different source of light. Heritagem presents : This beautifuf bangle is adorable. It set with 3 white naturals pearls : the one in the center is 5.29 mm of diameter and the two others 4.32 and 4,29 mm. They have both a beautiful luster and orient. The shoulders of the bangle are nicely adorned with 2 old mine cut diamonds for a total weighing approximately 030ct and with rose cut diamonds which are quite lively and sparkly. The bracelet was perfectly handcrafted in France in 18kt gold and silver at the very beginning of the 20th century. It closes firmly with a snap and it is secured with a chain. The strap was marked twice with the Rhinoceros' and the eagle's head. We can also see clearly the maker's mark however it is quite hard to read. The bangle weighs 14,3 gr and measures6,4 cm x 5,8 cm x 1,9 cm / 2,5 ' x 2,3' . It is in good antique condition. The gold is smooth and shiny. 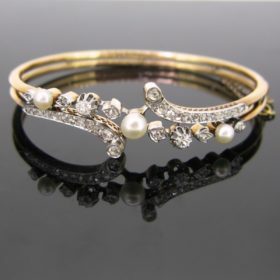 The diamonds are set on silver and the rest of the bangle is in 18kt gold.Pearl symbolises purity and innocence; they are usually wear by the bride for her wedding. The legend said that pearls are the tear-drops of the moon, fell in the sea. This is the only birthstone which have 5 months of the year : February, April, June (traditional) and November. That's why this bangle could be the perfect gift for the one you want to reveal your sincerity. All our items come with either a gemological report or a jewellery report with circa and all useful information. Heritagem presents : This brooch is ravishing ! It was made during the Forties. The design is completely characteristics of the Retro time. It is airy, colorful and very refined. It presents a flowery design, with a carved emerald in its center. Two dishes are adorned with deep blue sapphires and surrounded with square cut rubies. 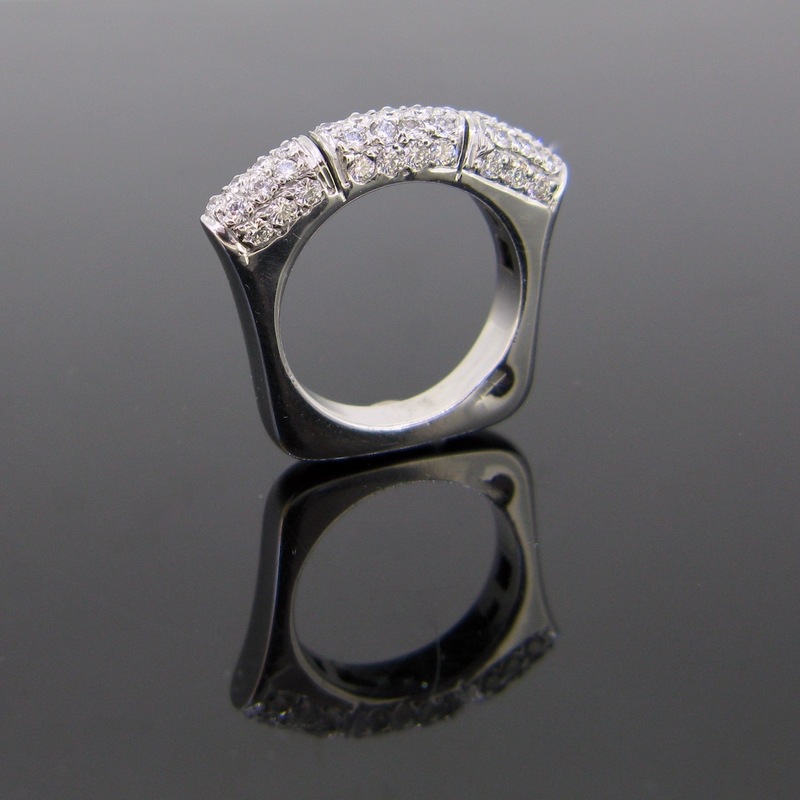 The two loops under are enhanced with diamonds : brilliant, old mine and rose cut. The brooch weighs 18,7gr and it measures 39,52 (1,55)x 48,02 (1,89) x 11,77 (0,46). The bar was controlled with the French Owl for 18kt gold and it was also tested as platinum.This brooch is lovely and it will perfectly fit with a little black dress or any clothes, it is so unique ;) All our items come with either a gemological report or a jewellery report with circa and all useful information. Heritagem presents : Those earrings are simply ravishing ! They were made at the very beginning of the 20th century, circa 1910. They're featuring briolette cut diamond, each weighing approximately 1ct. They are beautifully surrounded with seeds pearls. The pearls have a greyish and creamy color. 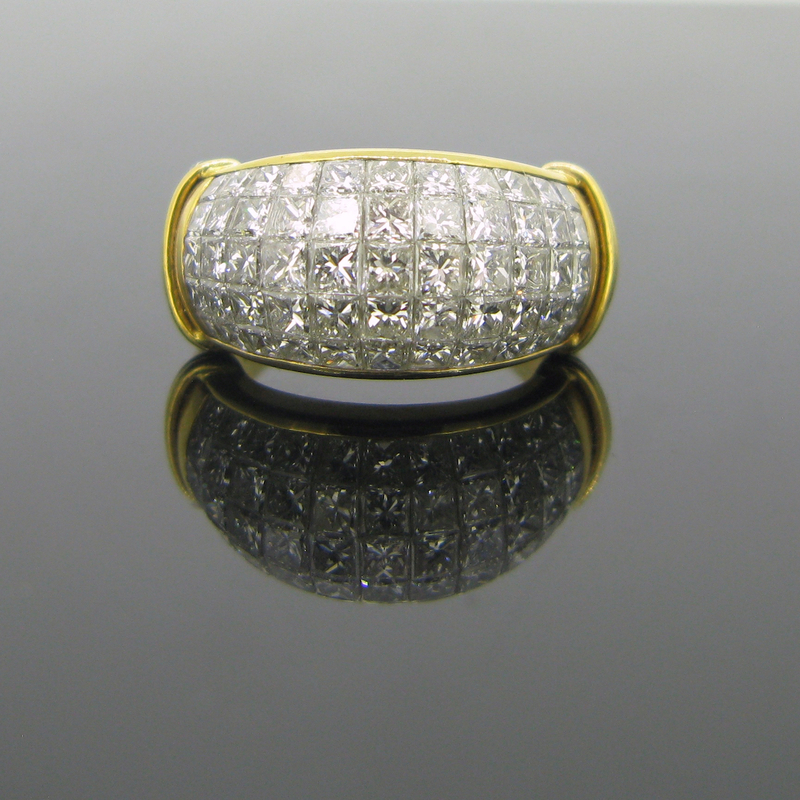 The mount is made in platinum and the hook is in 18kt yellow gold. The top of the earrings are adorned with a an old mine cut diamond (0,05ct approximately each). How refined they are ! Its weigh 2gr and measures 3,5 cm long / 1,38 inches and they are 10,5 mm / 0,41 large. The briolettes are color J/K and clarity VS/SI. The rim of the inside mount was engraved with a number, which is quite hard to read. It is in very good antique condition.Briolettes are a beautiful and elegant type of gemstone cut. The word Briolette refers to the pear-structured stones that are cut in extended triangular facets. It is one of the oldest cuts in the world, dating back to at least 800 years ago. In history, the briolette cut was reserved only for royalty and those of noble standing. Actually, the French emperor Napoleon himself presented the Empress Marie Louise with a diamond necklace containing 10 briolette-shaped gems.You will love wearing those, it is very elegand and quite easy to wear every day. All our items come with either a gemological report or a jewellery report with circa and all useful information. 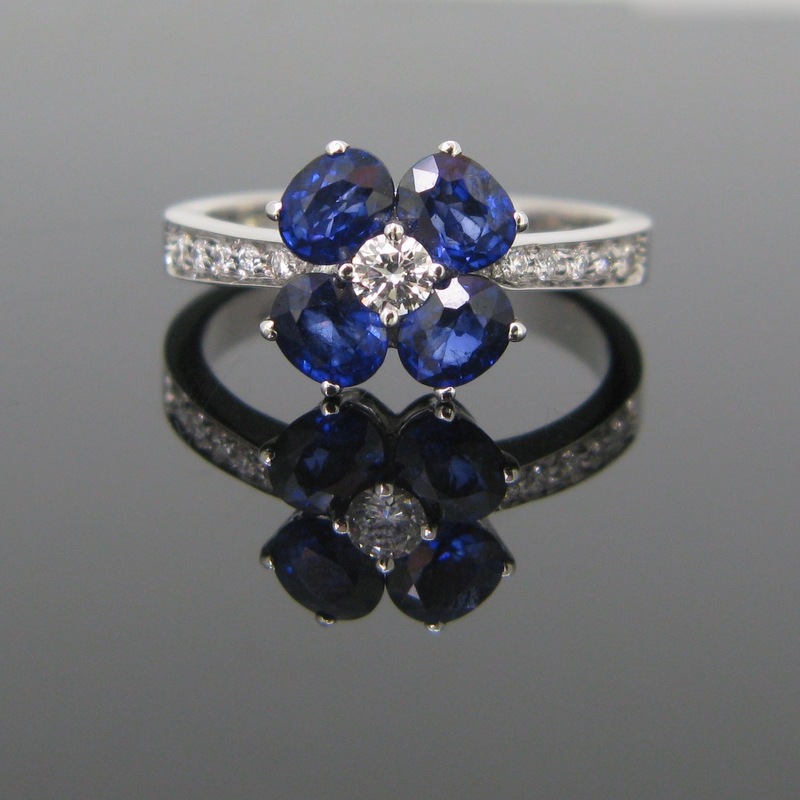 Heritagem presents : A sapphire and diamonds cluster ring. This ring is a timeless piece of jewellery and the perfect engagement ring. It is set with a stunning ocean blue sapphire weighing 2,12ct from Ceylon. 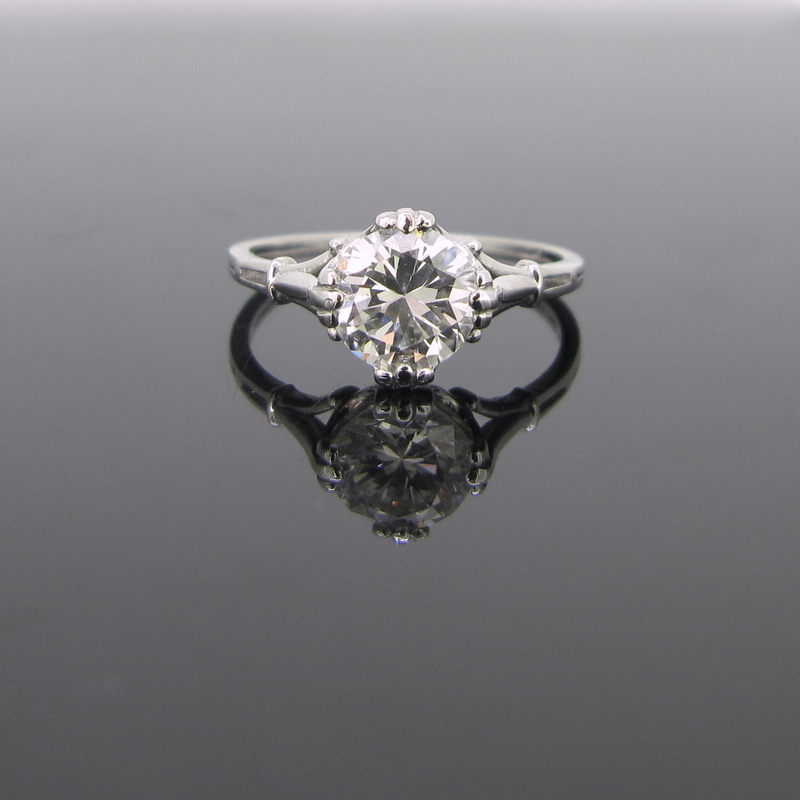 It is surrouned with brilliant cut diamonds for an approximate total weight off 0,30 ct (color H / clarity VS). Sapphire celebrates 16 years of marriage and also symbolizes happiness and fidelity. It is set on 18kt white gold and it was controlled with the UK hallmarks. 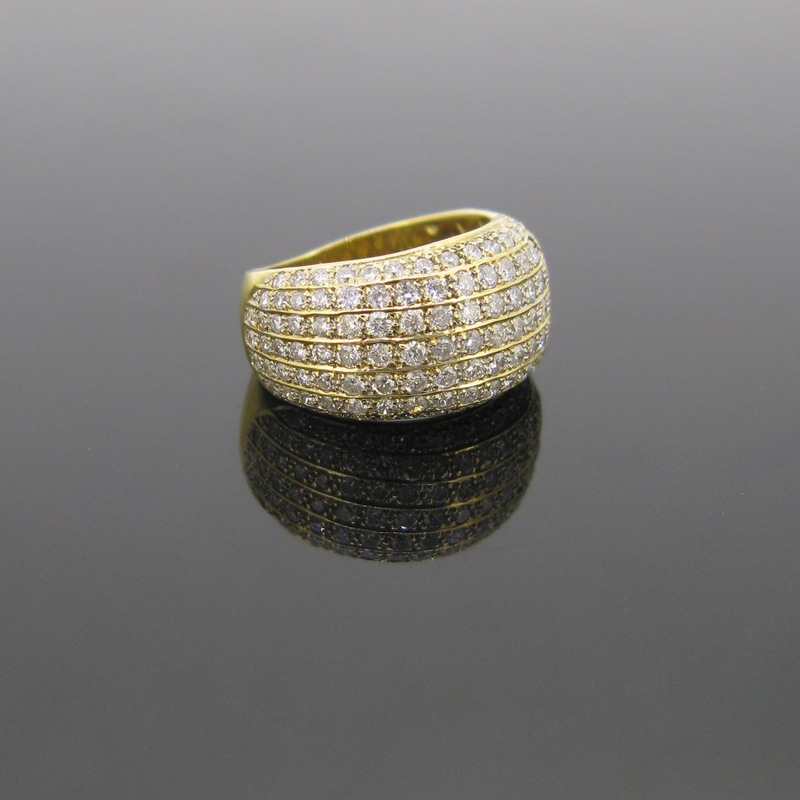 Heritagem presents : This ring is a timeless piece of jewelry ! This Solitaire ring is set with a transitionnal cut diamond weighing approximately 1.50ct with a color I and a VS clarity. The diamond is secured with 12 claws on an airy mount. 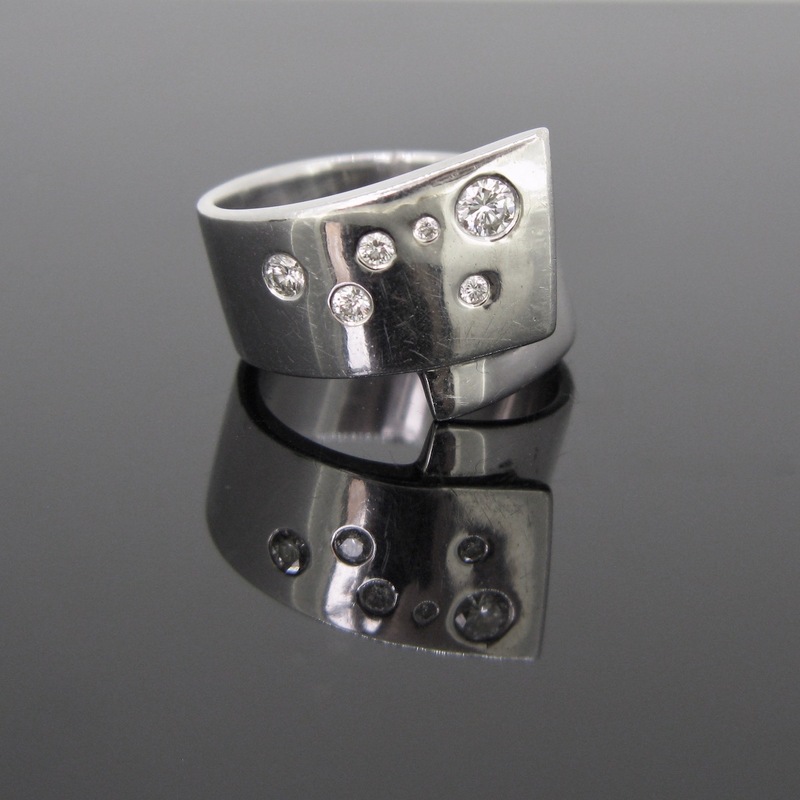 The design of this ring is inspired by the Art Deco design. The soulders of the ring are slightly opened. It was perfectly crafted in 18kt white gold. The saying is that Diamonds are forever : which is the perfect verse to reflect the love between a bride and groom. A solitaire diamond ring symbolizes the eternal and indestructible union between lovers. You will love wearing it ! Heritagem presents : A ravishing pair of earrings. 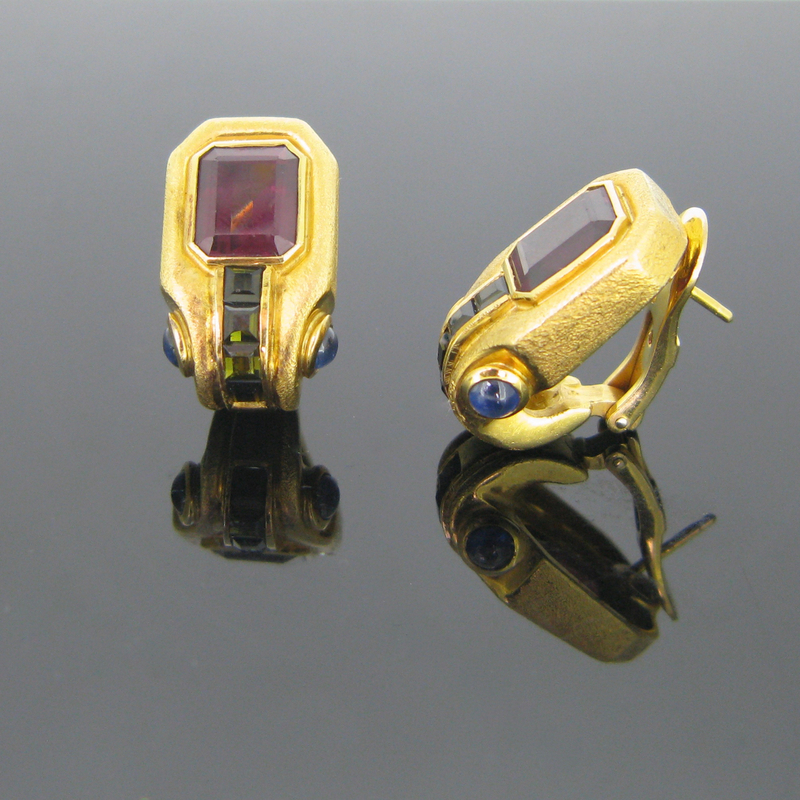 These one are set with a rectangular step cut tourmalines frame on a geometric golden mount. The bottom is adorned with square cut green tourmalines and the shoulders are enhanced with cabochon cut sapphires. The reddish pink tourmalines are around 2.60ct each. These earrings have a Retro design and very easy to wear for everday. Heritagem presents : A lovely diamonds pendant on a 18kt gold chain. 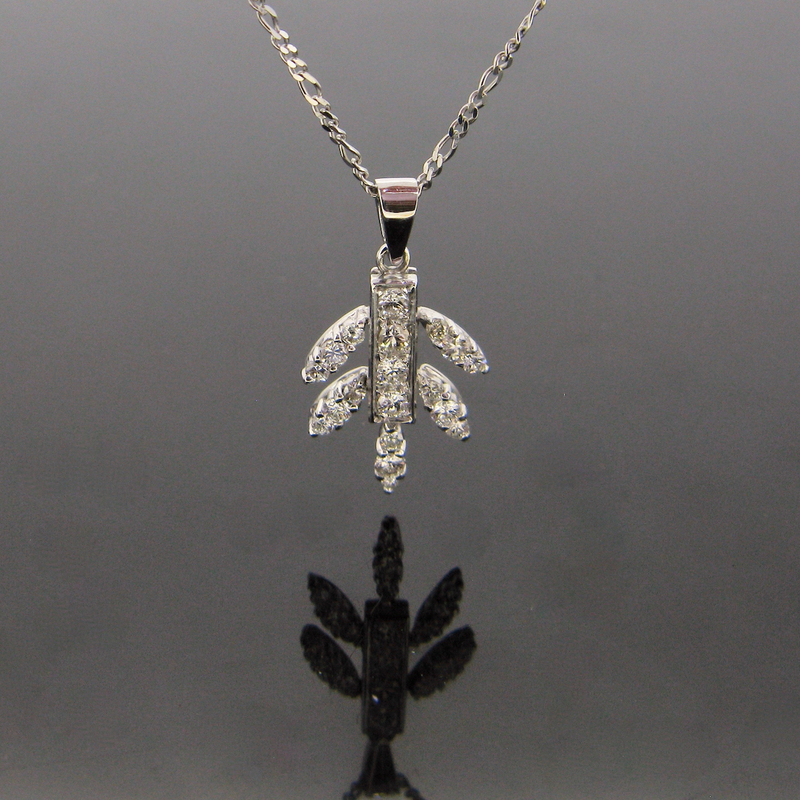 The pendant features 5 18kt white gold leaves , adorned with 19 brilliant cut diamonds for an approximate total carat weight of 1ct (color H / clarity VS). The pendant goes with a chain. This one is 50cm long and it could be easily adjusted. This necklace could be the perfect present to celebrate your love ! Heritagem presents : These earrings are beautiful ! They are set with a pear shape tanzanite, each weighing 3.19ct and they are topped with a heart shape diamonds (2x 0,25ct color H / clarity SI). 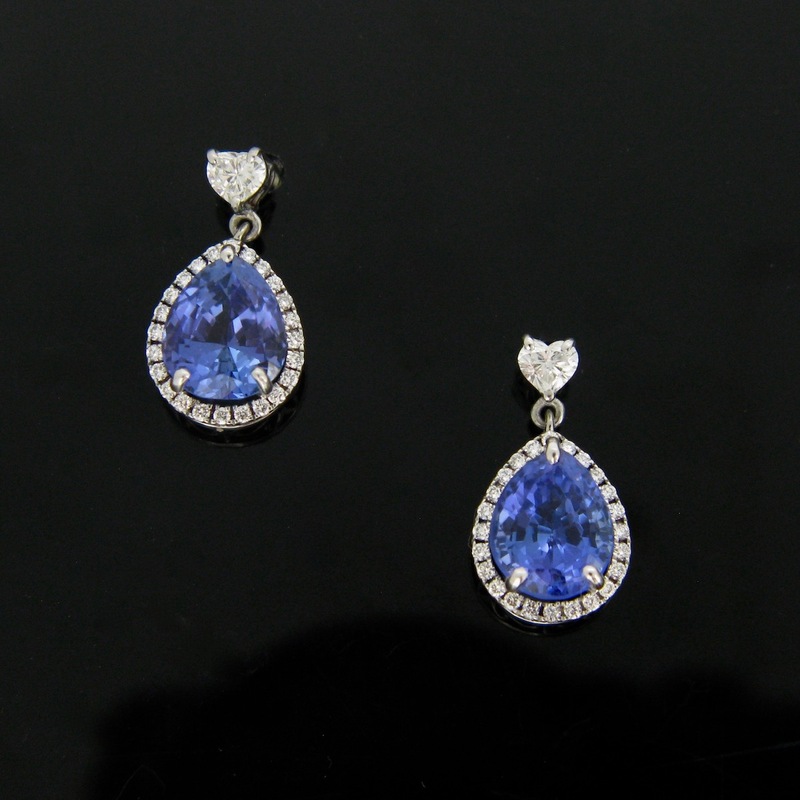 The tanzanites are also magnified with a crown of brilliant cut diamonds. They are set on a stunning and an airy mount, which has a lovely scrollwork. The color of the tanzanites is absolutely ravishing. The tanzanite is a rare gemstone which was discover during the Fifties in Tanzania, from which takes its name. You can only find this gem in Tanzania and it is very sought-after after the sapphire. Its color changes blue to indigo on a different source of light. Heritagem presents : A unique pair of dangling earrings. The design inspiration comes directly from the Art Deco period. It is flowery and geometric. How refined is this pair ! They are made in 18kt gold and adorned with different gemstones. The black is Onyx, an ornemental stone. We can easily recognised the most 4 famous precious stones : the diamonds, rubies, emeralds and sapphires. This pair was perfectly handcrafted. It is very airy and refined. They are 6,5cm long and they could be perfect for a special occasion. 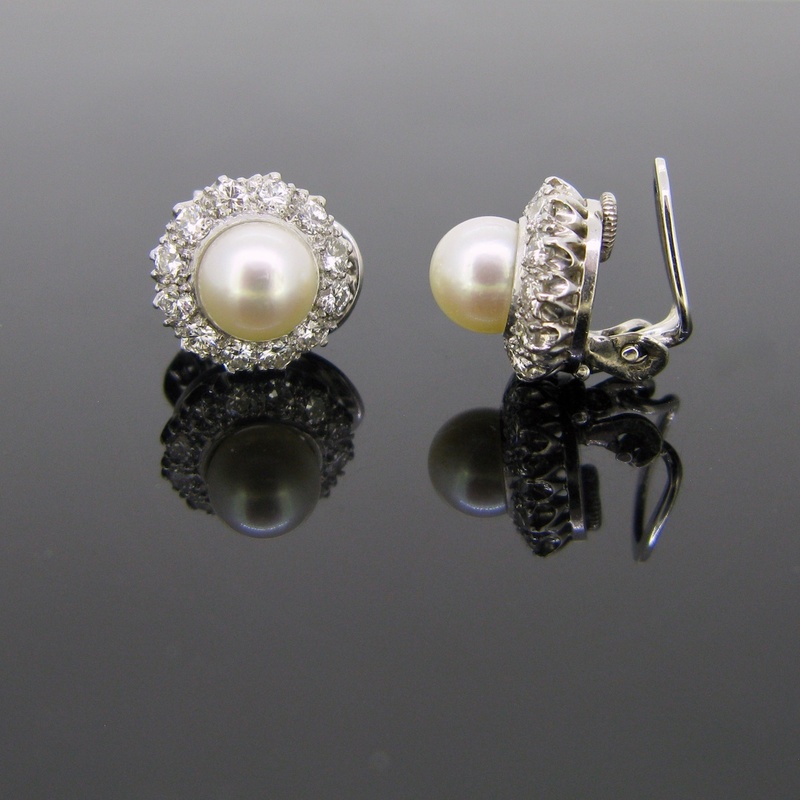 Heritagem presents : These earrings are just perfect for a wedding : there are pearls and diamonds... what else ? 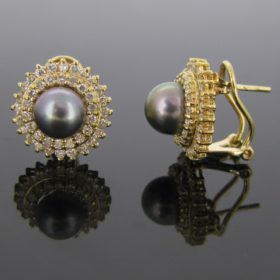 These beauties are made in 18kt gold and they are set with a creamy pearl in its center. The pearl is surrounded with brilliant cut diamonds (total carat weight : 0,70ct approximately). The cultured pearls are 7.4mm of diameter and the diamonds have a H color and a VS clarity. You can wear them thank to the clasp. Pearl symbolises purity and innocence; they are usually worn by the bride for her wedding. The legend said that pearls are the tear-drops of the moon, fallen in the sea. This is the only birthstone which has 5 months of the year : February, April, June (traditional) and November. Heritagem presents : This pendant is ravishing. It features a white creamy pearl of 11,3 mm of diameter topped with brilliant cut and tappers cut diamonds. The diamonds are very sparkly and lively. There is a total carat weight of 1ct approximately. The pendant was controlled with the english hallmark and the chain with the French owl for 18kt gold. The chain is 44 cm long. It could perfectly fit for every day or for a special occasion like your wedding. Pearl symbolises purity and innocence; they are usually worn by the bride for her wedding. The legend said that pearls are the tear-drops from the moon, fallen in the sea. This is the only birthstone which has 5 months of the year : February, April, June (traditional) and November. 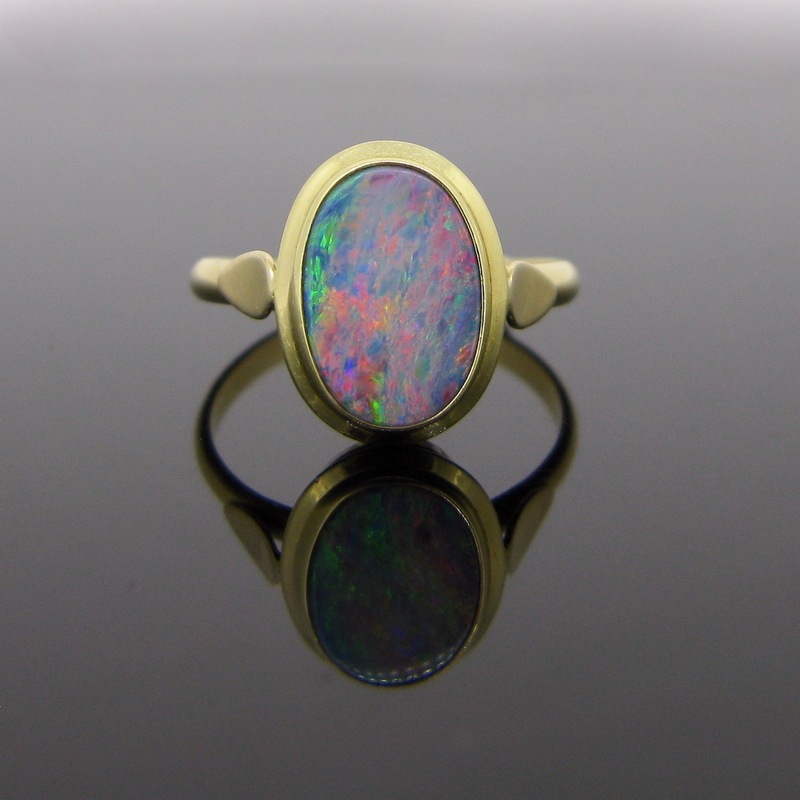 Heritagem presents : This lovely ring is ravishing. It is made in 18kt yellow. It is a Marquess ring : its name comes from the smile of the Marquise de Pompadour, the mistress of the French king Louis XV who offered her a ring of the same shape of her delicate smile. This ring features 18 sparkly brilliant cut diamonds for a total weighing approximately 2ct. The shoulders are also adorned with diamonds.The ring weighs 7,2gr and its size 51 / 5,5. It measures 23,9 (0.) x 20 (0,7) x 26,9 (1) mm (inch) It is in very good condition. It is marked with the French eagle's head for 18kt gold. It could be easily resizable, feel free to ask, we will be happy to do it for you :) All our items come with either a gemological report or a jewellery report with circa and all useful information. 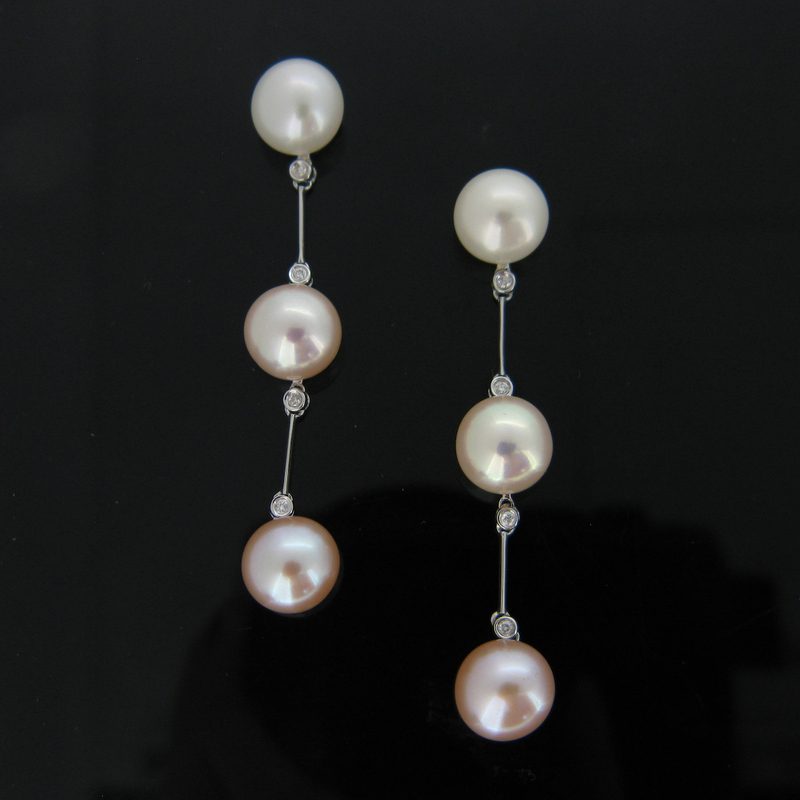 Heritagem presents : A ravishing pair of cultured pearls and diamonds earrings. They are 6cm long and they are adorned with cultured pearls with a shading of white to pink color. 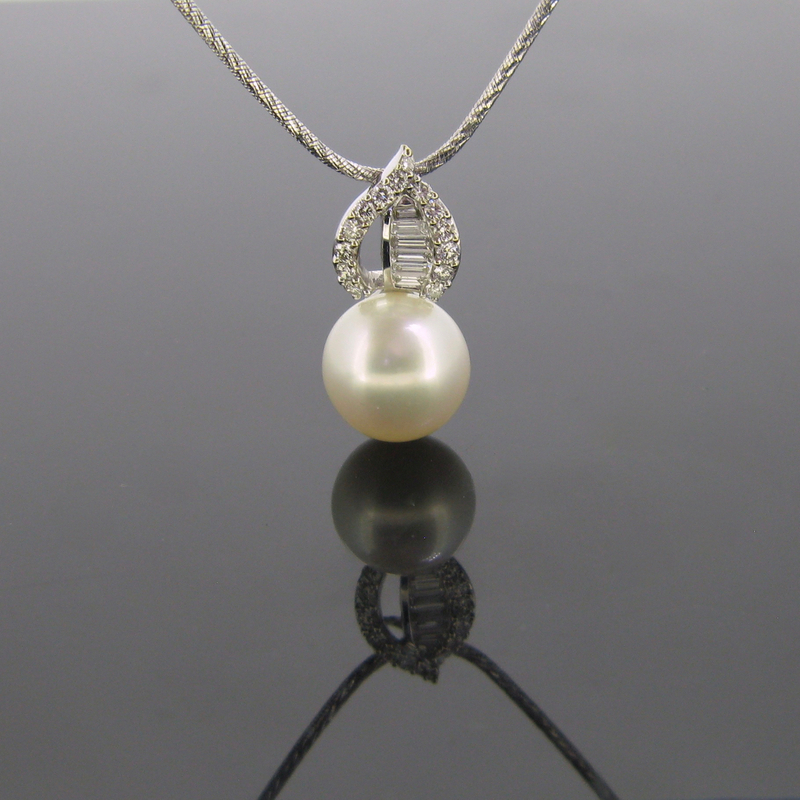 The pearls are set on 18kt white gold and interspersed with diamonds. They are between 10 to 10,4mm of diameter and they have a beautiful color. Pearl symbolises purity and innocence; they are usually wornby the bride for her wedding. The legend said that pearls are the tear-drops from the moon, fallen in the sea. This is the only birthstone which has5 months of the year : February, April, June (traditional) and November.The earrings weigh 11,4gr and they measures 6cm long.All our items come with either a gemological report or a jewellery report with circa and all useful information. Heritagem presents : This ring is mesmerising and very imaginative. 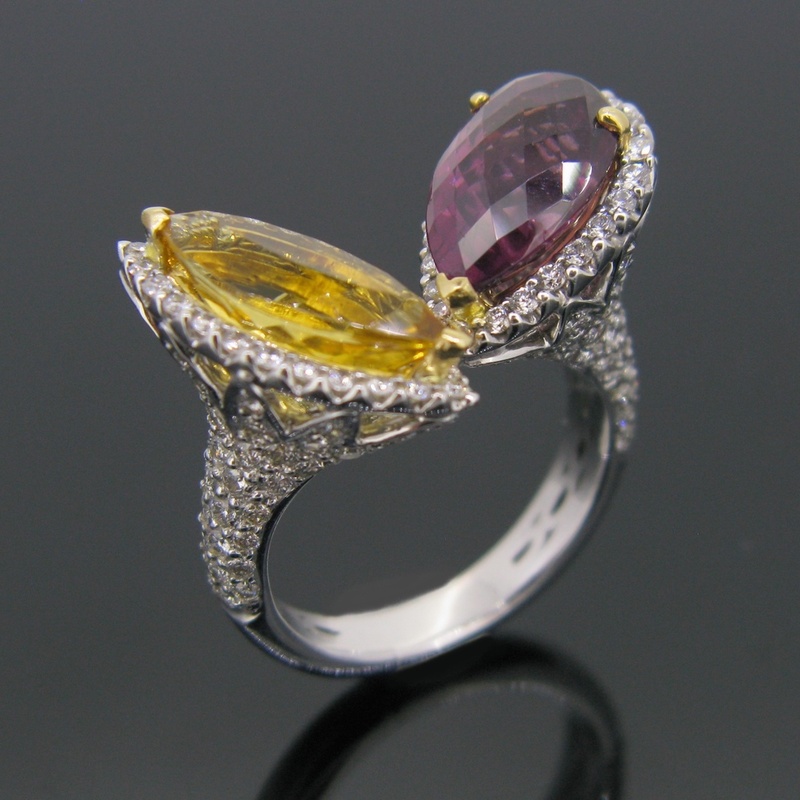 It reminds us the lotus flower, opened on a shiny Citrine and on a juicy pink Garnet. The leaves were beautifully adorned with brilliant cut diamonds. The Marquise shaped and faceted citrine is around 3,80ct and it is eye clean. The pinkish purple garnet has a briolette cut and it is around 6.8ct. Both of the beautiful gemstones are surrounded with diamonds, as the shoulders. There is an approximate total weight of 3,40ct with a color H and clarity VS. The ring is in very good condition. It weights 15,4gr and it sizes 62 / 10. It is easily resizable, feel free to ask we will be happy to do it for you (included into the price). The ring was controlled with the French hallmark for 18kt gold : the Owl. Heritagem presents : A pair of Tsarovites and diamonds earrings. These earrings are so unique ! 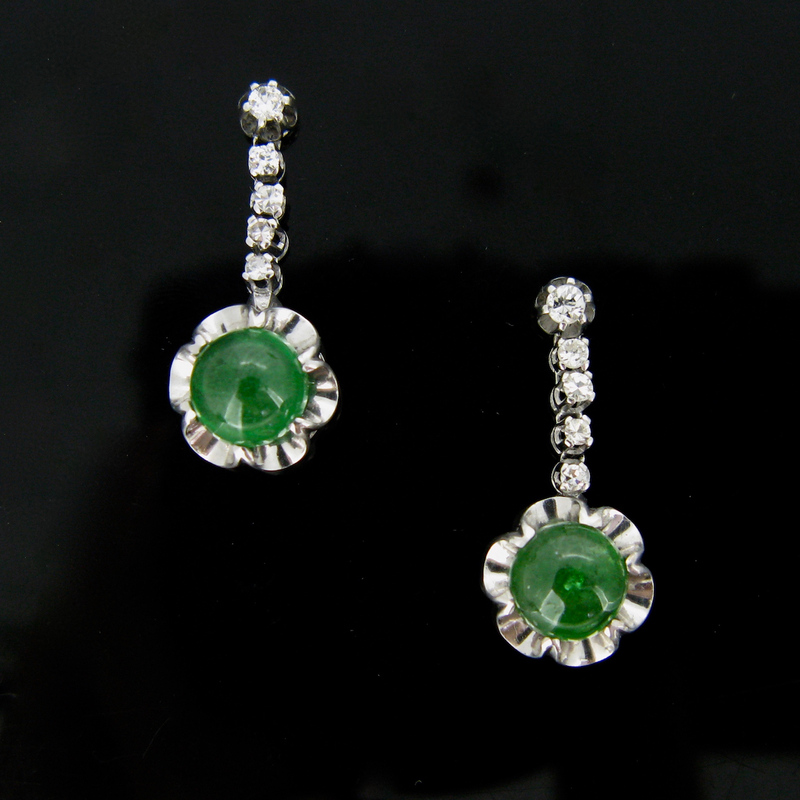 They are made in 18kt white gold and they are set with a dangling Cabochon cut tsavorites into an illusion setting. They are topped with crescendo line of diamonds, for a total carat weight of 0,40ct approximately. The tsavorites 8 x7,38 mm of diameter. The tsavorite is a green garnet which was discovered in the park Tsavo in Kenya (Africa) in 1974. Its color is very close to the emerald. It is a very much sought-after gem due to its color. The earrings weighs 8,4gr and they are 26,8mm long. They were controlled by the London Assay Office as 18kt gold. The garnet celebrate the second year of anniversary ! All our items come with either a gemological report or a jewellery report with circa and all useful information. Heritagem presents : This ring is pave set with brilliant cut diamonds for a total weighing approximately 2ct, with a clarity VS/SI and color H. The diamonds are quite lively and sparkly. It was nicely handcrafted in 18kt yellow gold. the gold is smooth and shiny. The mount features a beautiful gold basket at the back. The ring band was controlled with the French eagle's head, the hallmark for the 18kt gold. This ring is ravishing and eye catching. It weighs 8,8gr and it size 6 / 52. It could be easily resizable. Feel free to ask we will be happy to do it for you (price included into the price). 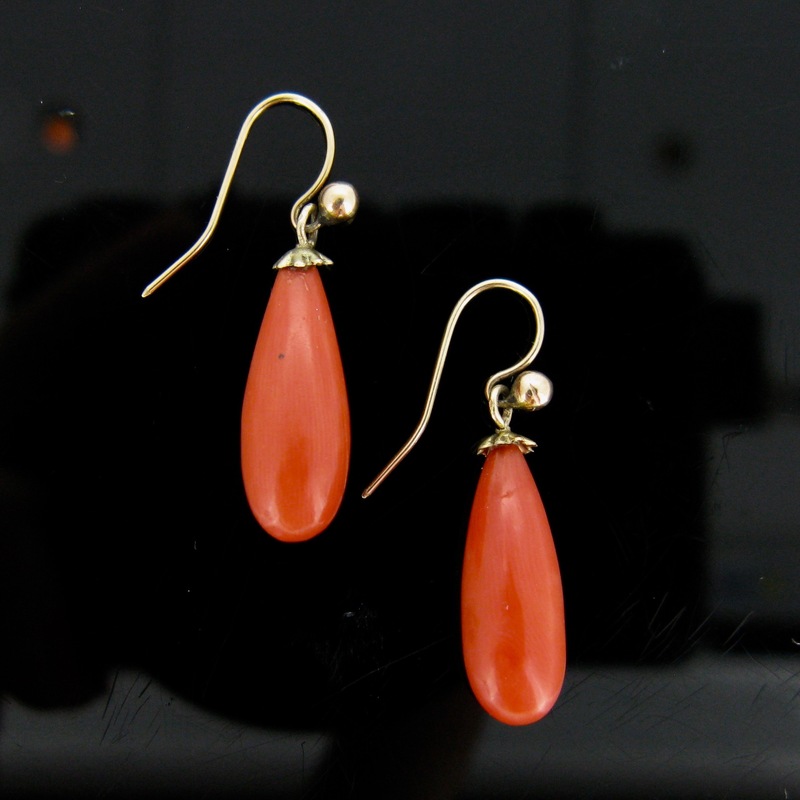 Heritagem presents : Those beautiful earrings features 2 beads of natural corals topped with a lovely 18kt gold ornament. It is set with 18kt gold hooks. The corals are in very good condition. They have a deep salmon color corals and they are of fine quality. It measures 32.20 (1,26') each and 7,26 (0,28) width.Red corals may have the virtue of giving vital energy that's why those two elements match perfectly together. All our items come with either a gemological report or a jewellery report with circa and all useful information. 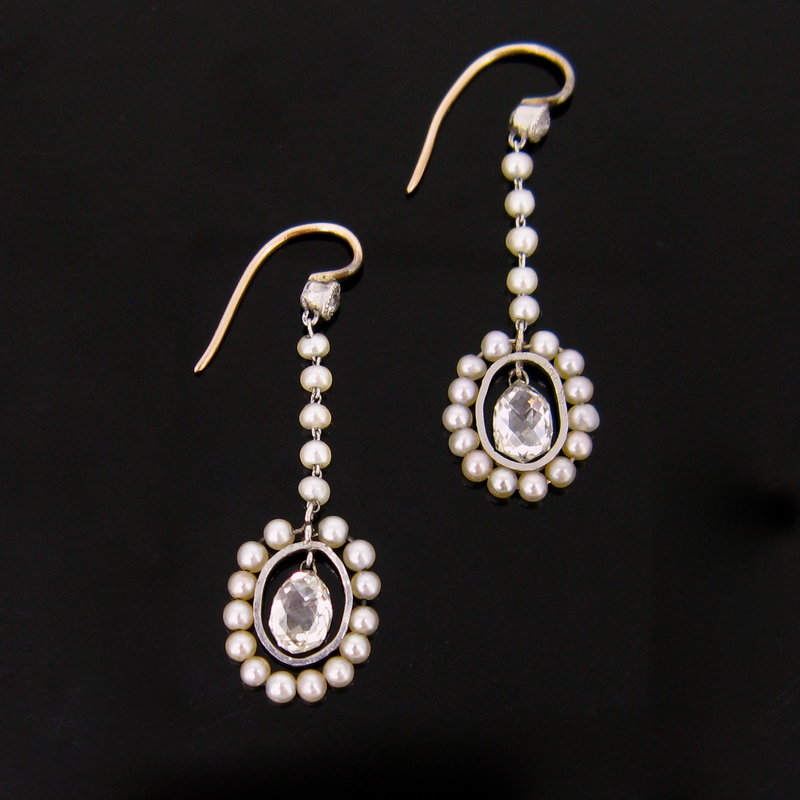 Heritagem presents :Those charming and refined earrings are made in 18kt gold. 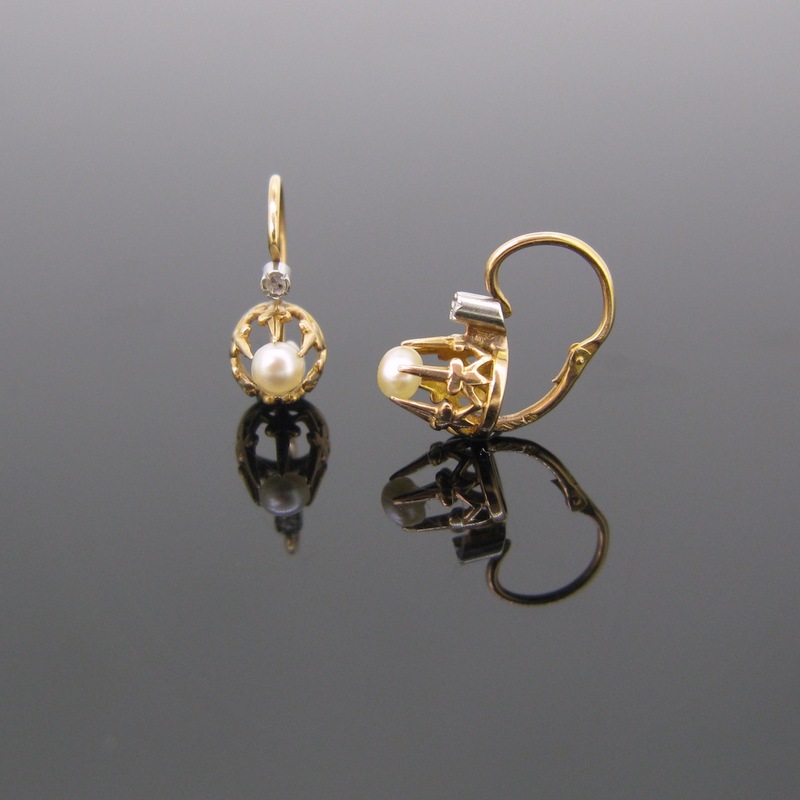 It present white pearls secured by 6 gold prongs with a fleur de lys design. It is of the highest quality and very refined. The natural fines pearls are 3,61 and 3,66mm of diameter. The pearl are topped with rose cut diamond set on platinum. They are completely original and very characteristic to the Victorian period, c.1880. You can wear from the front. The French control mark for 18kt gold is featuring by the eagle's head with the counter mark, the maker's mark (A /ARE/ STAR) and a serial number 4152.They weigh 2,4 gr and are very easy to wear. It measures 15,1 mm x 14 x 6,89 mm (0,59 x 0,55 x 0,27') . We call it Dormeuses because women used to sleep with them how they are delightful to wear. It provides elegance and grace. You will love it, they are just ravishing !Pearl symbolises purity and innocence; they are usually wear by the bride for her wedding. The legend said that pearls are the tear-drops of the moon, fell in the sea. This is the only birthstone which have 5 months of the year : February, April, June (traditional) and November. That's why this ring is the perfect gift for the one you want to reveal your sincerity. It is in good condition and was gold tested as 18kt gold.All our items comes with either a gemological report or a jewelry report with circa and all useful information. Heritagem presents : This half set is absolutely ravishing ! It features an adorable garland and ornemental trimmings. 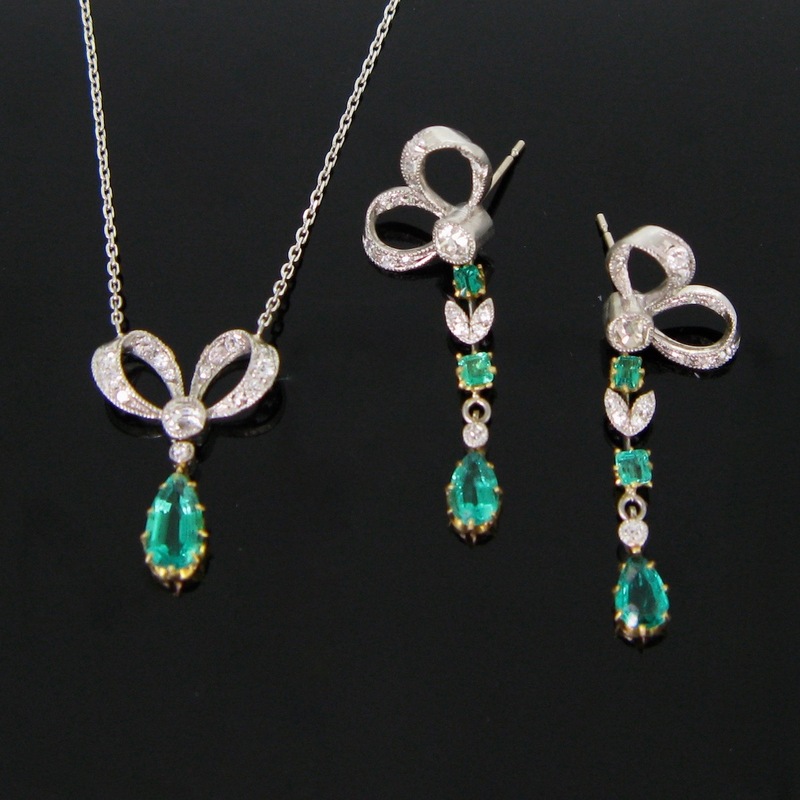 The earrings and the necklace are made in platinum and the emeralds are set on yellow gold. Earrings : The pendants have a refined knot made in platinum and set with diamonds on a millegrain setting. There is a total carat weigh of 0,90ct approximately . The pear cut emerald on the tassels are both around 0.30ct. Each earrings weigh 2,6gr . Necklace : The pendant has the same pattern of the earrings. The center is adorned with an old mine cut diamond weighing approximately 0,20ct and the knot is set with 12 diamonds (tcw :0,20ct app). 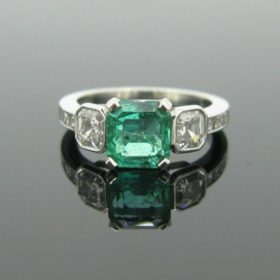 The emerald is eye clean and it is around 0,55ct. The chain is in platinum and it is 44 cm long, it could adujsted. 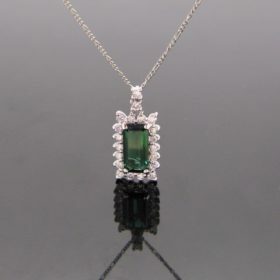 The necklace weighs 4,7 gr and it is in good condition.The emeralds have a beautiful strong green color and they are rather clean. 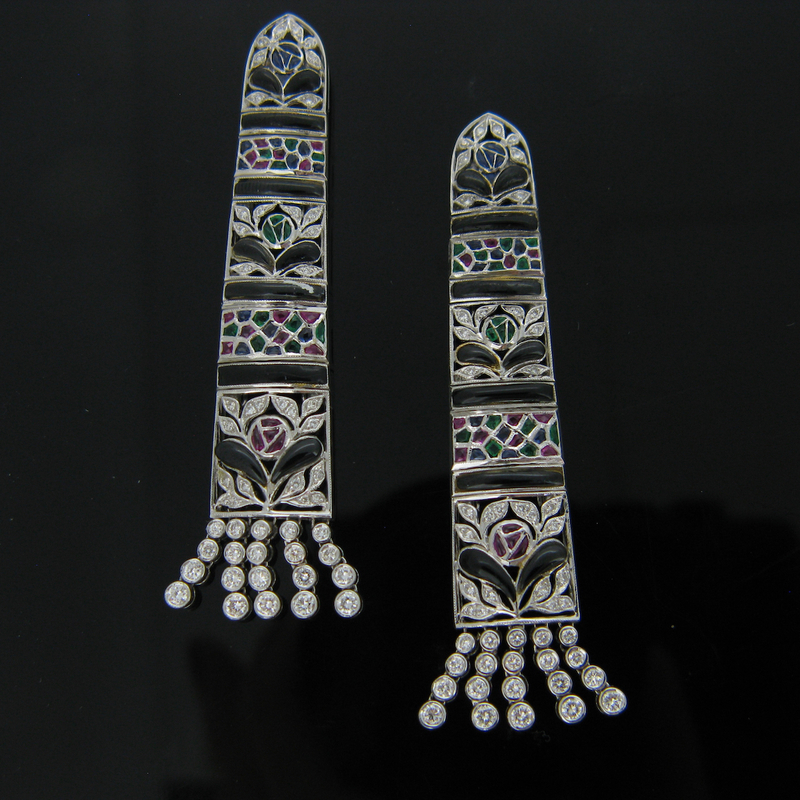 This set is very refined and characteristic of the Edwardian period. All our items come with either a gemological report or a jewellery report with circa and all useful information. 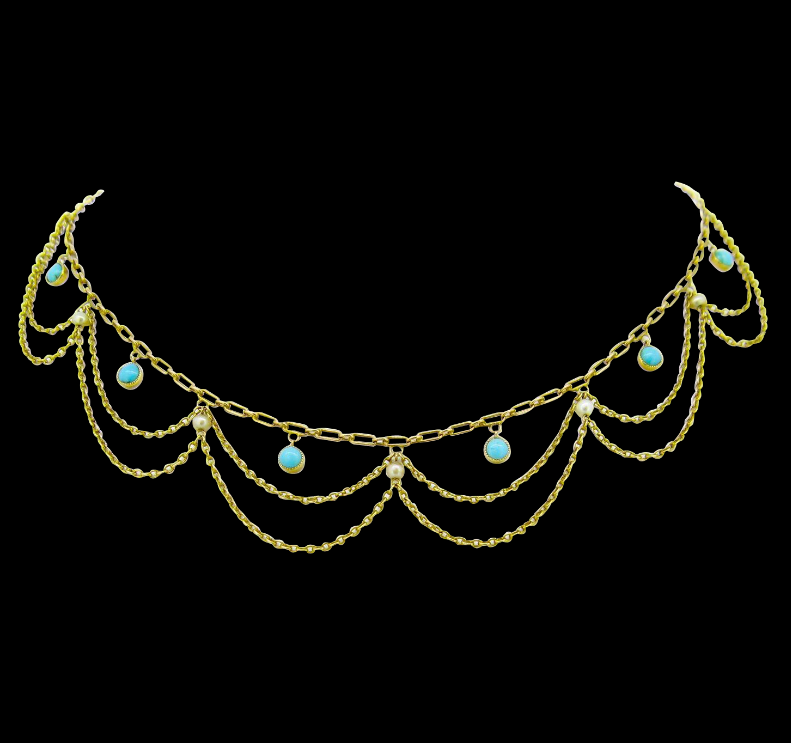 Heritagem presents : This very refined French necklace features 12 festoon adorned with seed pearls and turquoises. It presents 6 mains festoones beautifully handcrafted and doubled with others festoons . Each links is set with genuine turquoises and adorned with seed pearls. The turquoises have a very nice color and they are 3.87 mm of diameter and the pearls 2.8 mm of diameter. In France, we call this kind of necklace : "collier draperie" because you can wear it as a piece of clothes and it drapes outstandingly your neck. It is in excellent condition for this period : circa 1880. Weight :9,2 gr Measurements :42cm long (16,53 inches). It is secured with a security chain and clasp. it was controlled with the French eagle's head. There is also the maker's mark but it is illegible.It is in good antique condition. It is very easy to wear with a little black dress or simply with a shirt. Pearl symbolises purity and innocence; they are usually worn by the bride for her wedding. The legend said that pearls are the tear-drops from the moon, fallen in the sea. This is the only birthstone which as5 months of the year : February, April, June (traditional) and November. Turquoises symbolises hope, courage and self confidence. It also helps to keep friendship alive. All our items come with either a gemological report or a jewellery report with circa and all useful information. Heritagem presents : These beautiful earrings are made in 18kt gold and adorned with a black ornamental stone: the Onyx. In the middle on the half hoop are set brilliant cut diamonds (total carat weight : 1ct approximately). 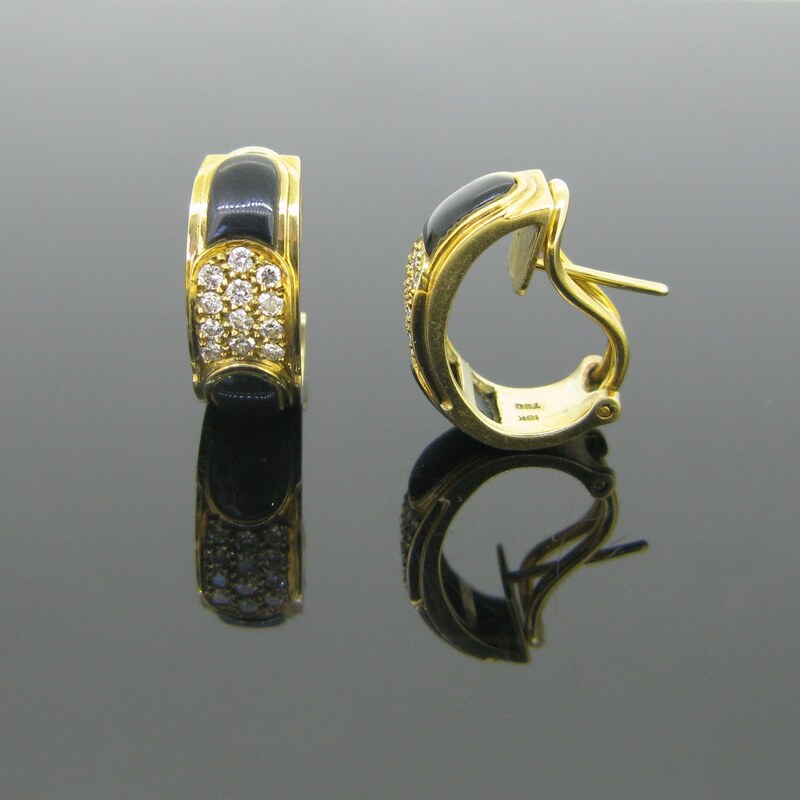 The half hoop earring is a timeless design, it is perfect for everyday. The earrings remain properly on the ears thanks to the clasp. It weighs 10,8gr and it measures 19,66 (0,77) x 18,19 (0,71) x 7,93 (0,31) mm inch. It was controlled with the UK hallmarks for 18kt gold. Heritagem presents : This ring is the revisited Toi et Moi classic design. It is adorned with 2 square shape emeralds framed with brilliant cut diamonds. It is also enhanced with 2 bigger diamonds in the middle. The emeralds are 0.50ct approximately each (tcw : 1ct ) and there is a total carat weight of 1,40ct for the diamonds (color H / clarity VS). The ring is made in 18kt white gold. Emerald is linked with hope and harmony. It symbolises the nature and the renascence of life. It celebrates 25 years of marriage :) The ring weighs 5,7gr and it sizes 62 / 10 (US). It could be easily resizable. Feel free to ask we will be happy to do it for you (included into the price). It was controlled with the English hallmark for 18kt gold. All our items come with either a gemological report or a jewellery report with circa and all useful information. Heritagem presents : Ths bracelet is made in 18kt white gold. It is simple but eye catching. 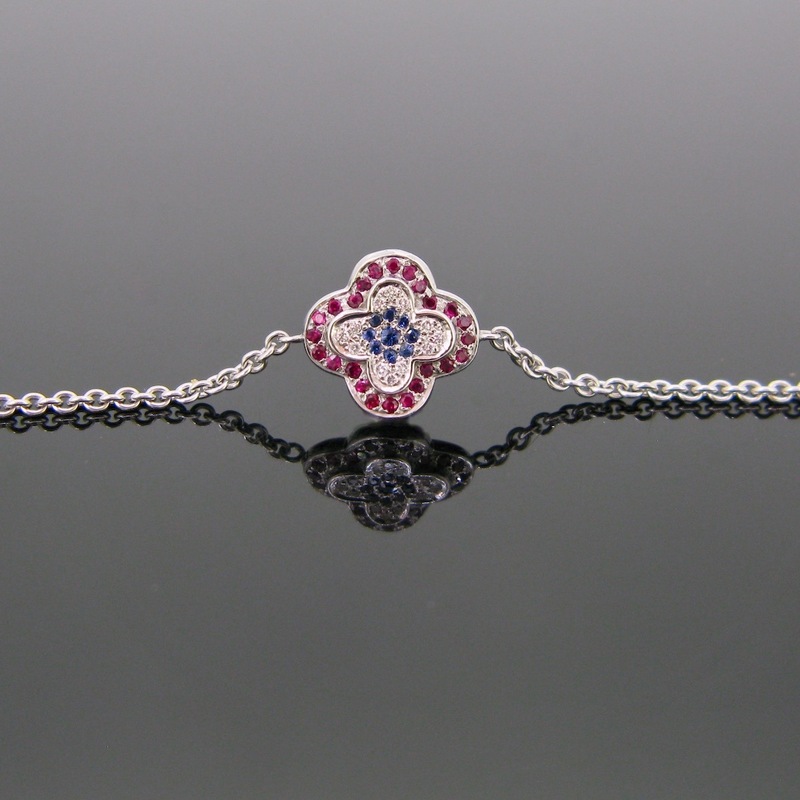 The center of the bracelet is paved with sapphires surrounded with diamonds and rubies. 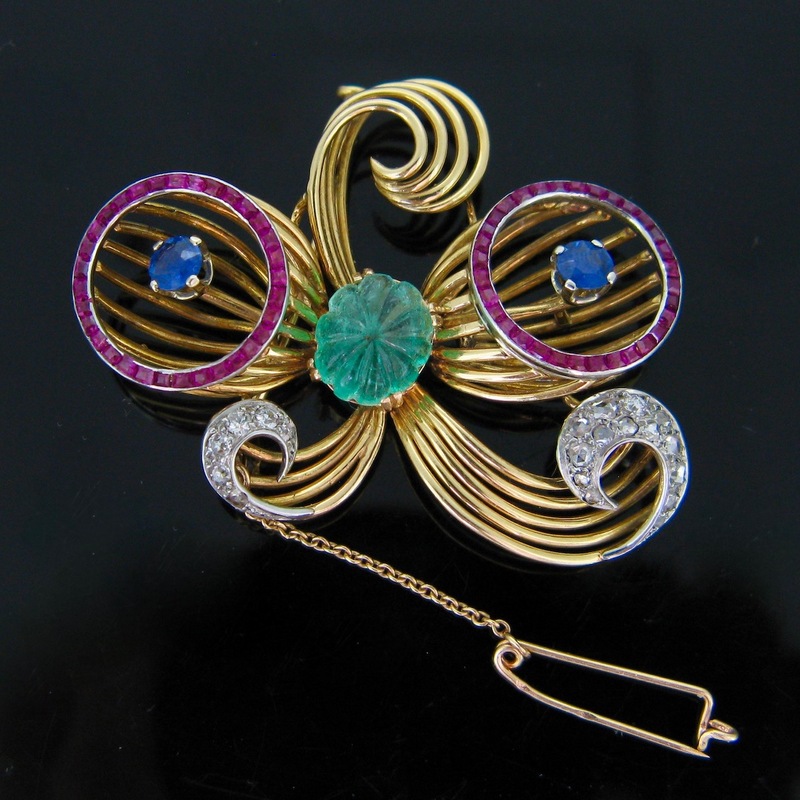 The design reminds us the famous clover of Van Cleef & Arpels. This ravishing bracelet brings you luck and joy. It measures 19cm long and it could be easily resizable to your wrist. Feel free to ask we will be happy to do it for you (price included into the price).This bracelet could be the perfect present to the person you loved, it is a timeless design and very easy to wear everyday ! All our items come with either a gemological report or a jewellery report with circa and all useful information. 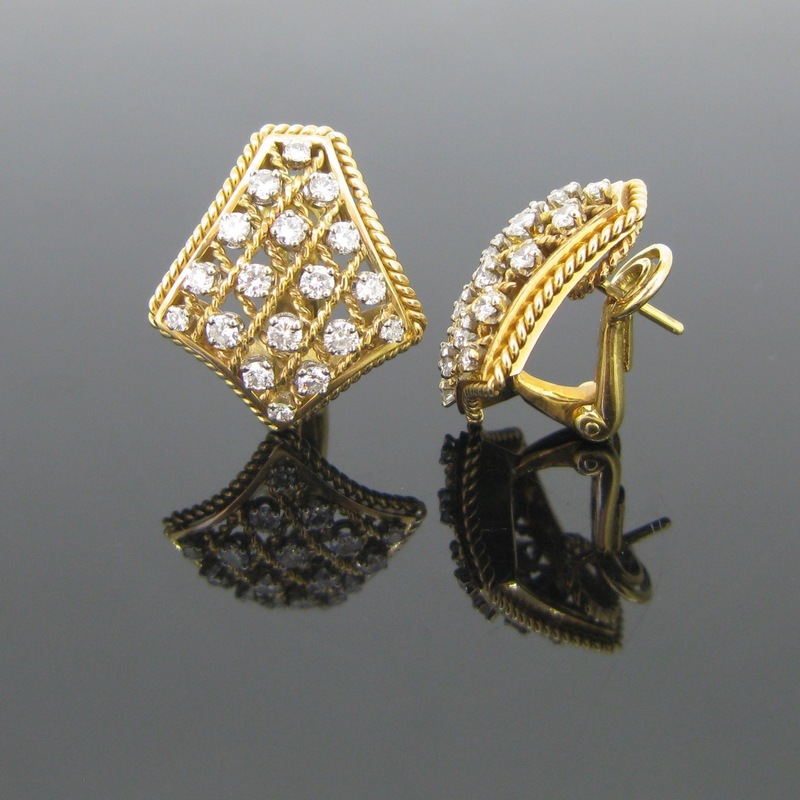 Heritagem presents : These beautiful earrings are made in 18kt yellow gold and they have a ravishing Retro design. The front is slightly domed and it presents a meshed pattern with twisted wired gold. Each earrings are adorned with 18 brilliant cut diamonds for an approximate total weight of 1,60ct (color H / clarity VS). The design comes from the Sixties. They are very easy to weat for every day. They are elegant and chic.They weigh 13,1gr and they were controlled with the French eagle's head twice. All our items come with either a gemological report or a jewellery report with circa and all useful information. Heritagem presents : This ravishing ring features a brilliant cut diamond in its center weighing approximately 0,15ct (color : H - clarity : VS). 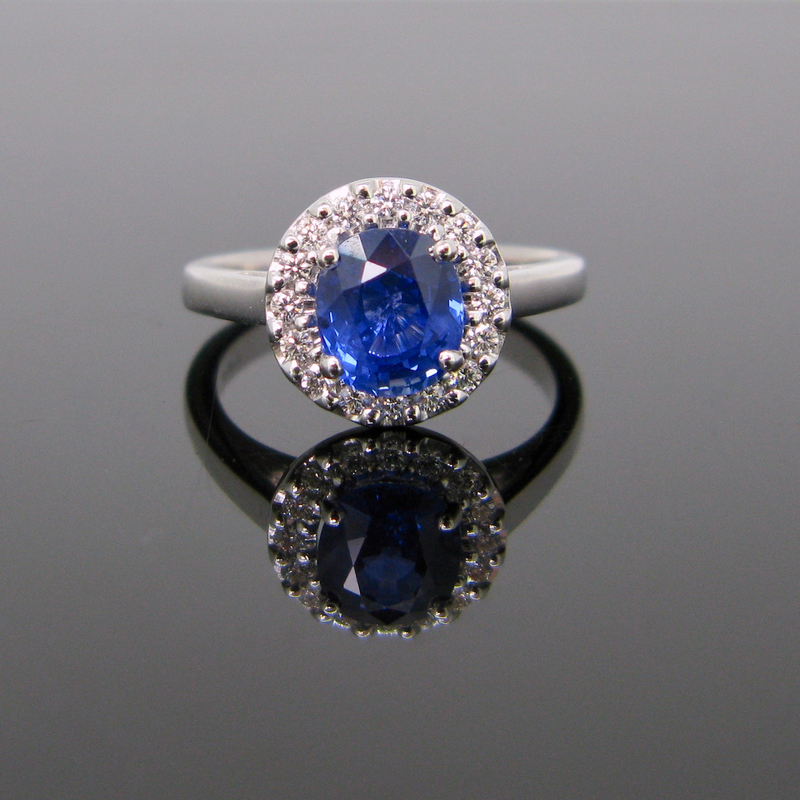 It is surrounding with 4 navy blue sapphires for an approximate total weight of 2ct. They have a stunning royal blue color and they are eye clean. The shoulders of the ring are adorned with 5 brilliant cut diamonds on each side. 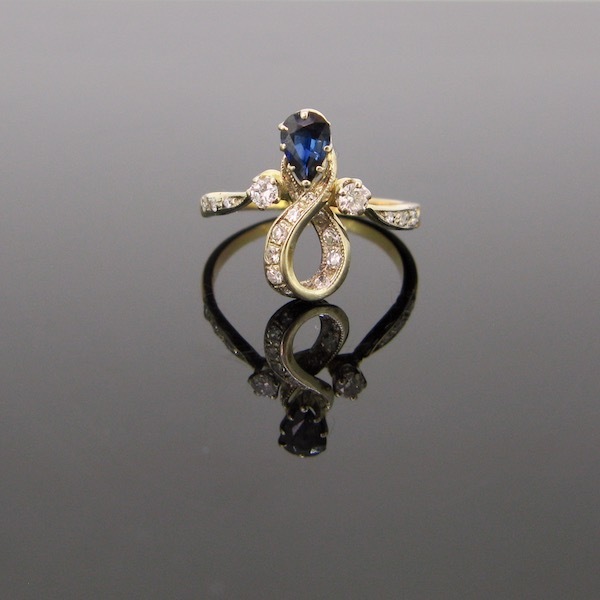 How lovely is this ring !Sapphire celebrates 16 years of marriage and also symbolises happiness and fidelity. The ring is in very good conditionIt could be easily resizable, feel free to ask we will be happy to do it for you. It is controlled with the French eagle's head. All our items come with either a gemological report or a jewellery report with circa and all useful information. Heritagem presents : This beautiful bangle is adorable. It set in its center with a fine pearl of 5 mm of diameter, surrounded with 8 old mine cut diamonds, for a total of 1,20ct approximately. The shoulders of the bangle are nicely adorned with rose cut diamonds. The bracelet was perfectly handcrafted in France in 18kt rose gold at the very beginning of the 20th century. It closes firmly with a snap and it is secured with a chain. The strap was marked twice with the eagle's heads and with the Rhinoceros' head. We can also see clearly the maker's mark : P / a feline / S. The bangle weighs 12,3 gr and measures 49,8 (1,9) x 56,7 (2,2'). The motif in the center is 12,9 (0,5') of diameter. It is in very good antique condition. The gold is smooth and shiny. 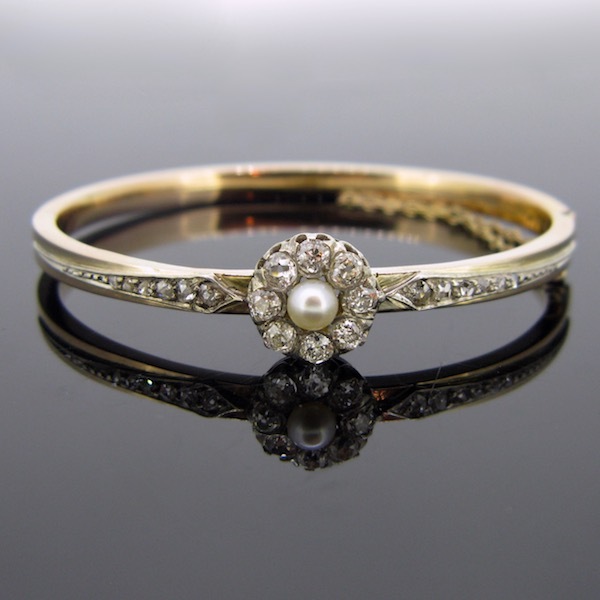 It is made in 18kt gold, the pearl and the diamonds are set on silver. It was tested by our lab.Pearl symbolises purity and innocence; they are usually worn by the bride for her wedding. The legend said that pearls are the tear-drops from the moon, fallen in the sea. This is the only birthstone which has 5 months of the year : February, April, June (traditional) and November. That's why this bangle could be the perfect gift for the one you want to reveal your sincerity. All our items come with either a gemological report or a jewellery report with circa and all useful information. 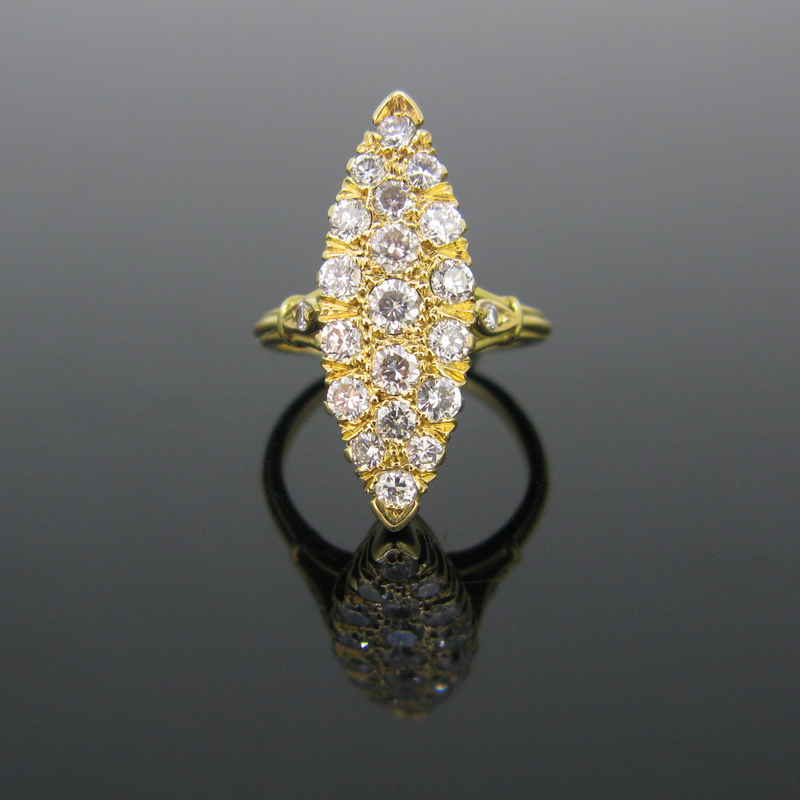 Heritagem presents : This outstanding ring is a real testimony of the early 19th century. We call this kind of ring a Fede ring or a Gimmel ring. Fede for faith, trust and fidelity and Gimmel for gemmelus : twins. This one is composed of 3 bands ring : 2 hands are concealing a heart. How ravishing is this ! According to the Lang Antique University, the first fede rings appeared during the Middle Age in France. They became very popular during the Renaissance all over Europe. They were given as a proof of fidelity, love and betrothal. We can see similar rings at the Victoria & Albert Museum in London and at the British Museum. These lovely rings are real treasures !This one weighs 5,2gr and it measures24,12 (0,94) x 19,90 (0,78) x 8,11(0,31). It sizes 52 / 6. 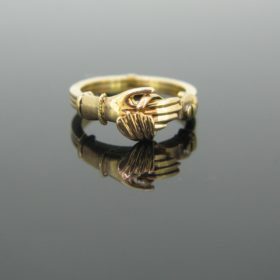 This ring was perfectly well handcrafted and it is in very good antique condition. It was made at the very beginning of the 19th century. It is marked 750 on one of the band for 18kt gold. All our items come with either a gemological report or a jewellery report with circa and all useful information. Heritagem presents: This lovely vintage necklace features 41 beads of natural Baltic amber. They have a beautiful deep orange color. The beads are between 12.05 mm (0,47') to 19,03 mm (0,74) for the largest one. 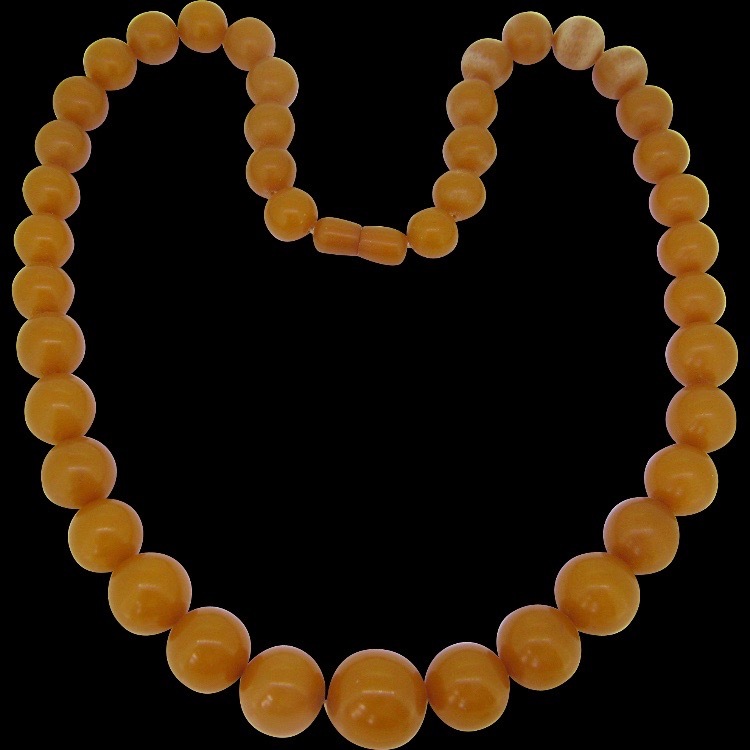 It has been tested as natural Baltic amber, slightly heated. It is in good condition. The necklace weighs 71,8gr and it is 62cm long (24'). It presents few traces of wears on few on them. You can open the necklace thanks to the srew closing. In the Greek mythology, amber come from the tears of the Heliades, the sisters of Phaeton, crying for their brother's death, whom where metamorphosed into trees. It brings joy and happiness and eases the pain. All our items come with either a gemological report or a jewellery report with circa and all useful information.